South Dakota coyote can be found in Custer State Park and throughout the Black Hills. Primarily nocturnal, coyote are most active from sunset to sunrise. The coyote is South Dakota’s state mammal. Listen to this: Coyote howling along the border of Custer State Park and Wind Cave National Park. South Dakota coyote are found in Custer State Park and throughout the Black Hills. Most famous perhaps for their distinct howl, the South Dakota coyote is one of the few wild animals whose vocalizations are commonly heard. The coyote has a range of distinctive sounds it uses to communicate with pups and other adults including barks, yips, howls, yelps and huffs. As with all canines, they also use body language (ears, tail, facial expressions) to get their point across. They typically have a grayish-brown coat and are about 30-34 inches in length plus an additional 12-16 inch tail. 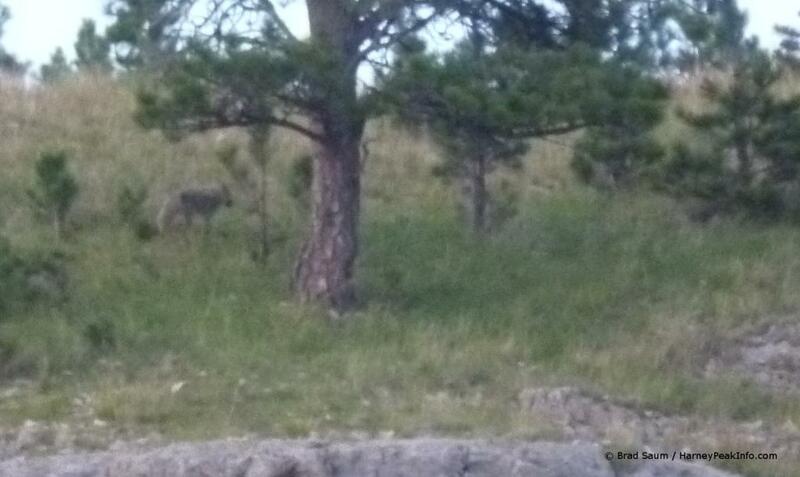 Frequently heard, but not seen, the South Dakota coyote inhabit the Black Hills. The South Dakota coyote diet is varied, but consists mainly of small mammals. They primarily hunt in pairs, and the typical packs are comprised of six closely related adults and their young. They live a maximum of ten years in the wild.